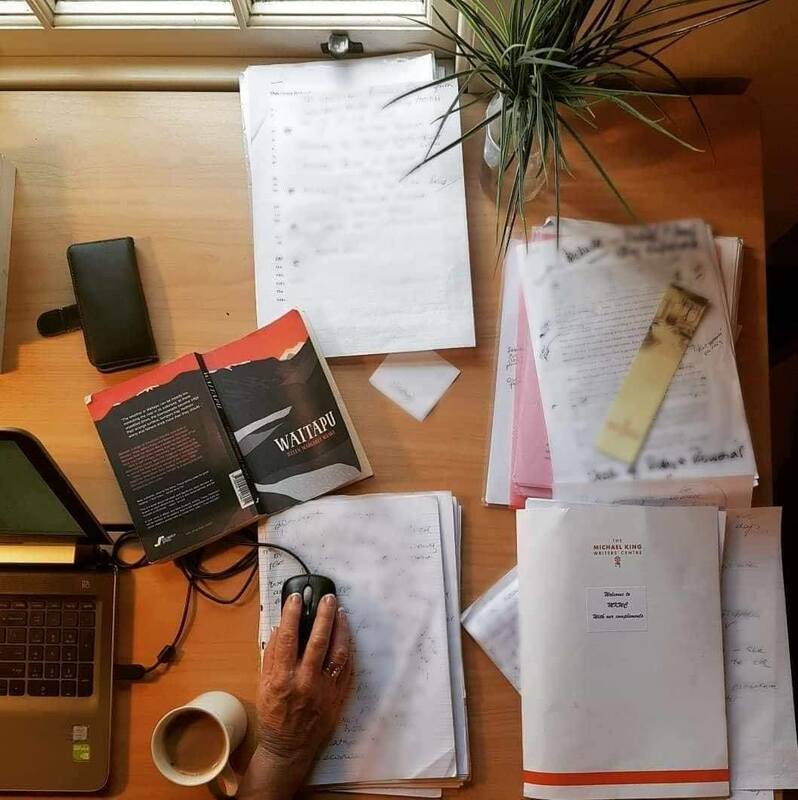 Helen Waaka, author of short story collection Waitapu, shares her experience as a recipient of an Emerging Māori Writers Residency at the Michael King Writers Centre in 2018. During this time Radio New Zealand expressed interest in broadcasting stories from Waitapu, and Helen recaps how she edited the work for a different media. I am sitting in the studio of the Michael King Writer’s centre, once the wash-house of the Signalman’s House at the base of Takarunga maunga, but now a place of creativity for resident writers. The view of Waitematā harbour and the city from the verandah is spectacular and through the small sash window of the studio the Auckland Harbour bridge is just visible. I am on the second day of a Michael King Emerging Māori Writers residency, basking in the thought of doing nothing else but write for the next two weeks. But first I check my emails. Duncan Smith from RNZ wants to discuss broadcasting five stories from Waitapu. Mary-Jane at Escalator Press has already been in touch with me about this and I have been walking on air ever since, holding the information like a piece of polished pounamu in my pocket. Is Duncan emailing to say he’s changed his mind? ‘Can you edit the stories and reduce the word count?’ he asks in his email. ‘They need to be 14 minutes duration and somewhere between 1900 and 2000 words.’ He has chosen three of my favourites. Hineraumati, The Pool, and Snapshot of a Woman. The word count for each story ranges from 2500-3000 words. He is still considering a further two stories. I start work that day rearranging sentences and paragraphs, cutting out unnecessary narrative and removing words that don’t alter the storyline too much. It becomes a satisfying process. That one final edit authors wish they could do prior to publication. Before starting work each day I walk up te tihi o Takarunga maunga. The view of Bastion Point reminds me why I feel so grounded in this place. Ko Ngāti Whaatua tōku iwi. One morning the ocean is covered in fog and the tip of Rangitoto to the east is floating in a sea of cloud. I return to the studio energised. On the morning of the third day I send Duncan three edited stories. I do as he asks without question. The stories will be on RNZ and I will do whatever it takes to make them work but this might be a good time to ask Duncan if I can choose a story. ‘A Sense of Belonging’ introduces the characters in the novel I am currently working on. Duncan agrees. The story gives a good snapshot of Waitapu as a collection he says, but at 3700 words it is considerably longer than the rest and will need to be broadcast in two parts. Five stories reduced to four, but I am happy. At te tihi o Takarunga maunga I see the Waiheke island car ferry on its way out. The city’s skyscrapers stand dominant across the Waitematā harbour, muffling the distant hum of Auckland’s traffic. 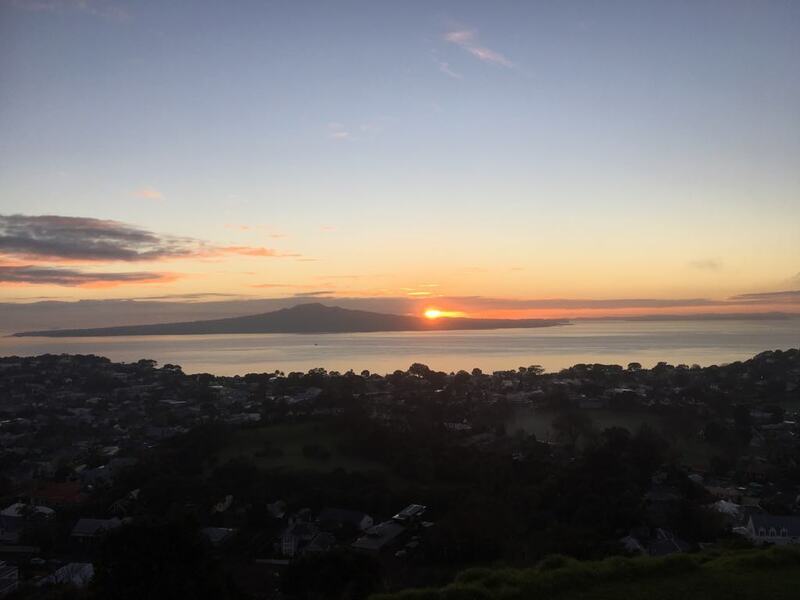 To the east the sun rises behind Rangitoto, its golden-pink glow stretching luminous along the horizon.